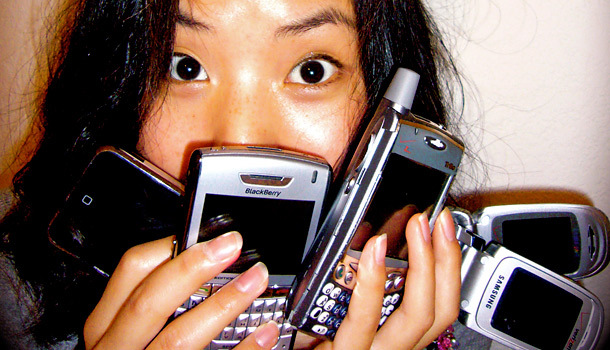 From iPhones to Androids to RIM (remember RIM? )–a look at who is poised to thrive as we enter the year of the smartphone. Reuters is reporting a poll of potential purchasers of smartphones in several nations–and top of the list sails Apple’s iPhone. There’s so much excitement that Reuters even feels it can tease “Apple, which lost its position as the world’s largest smartphone maker to Samsung last quarter, could regain top spot as consumers rush to buy the latest iPhone after waiting 16 months since the previous model went on sale”…something we predicted a while ago. According to the numbers, the iPhone’s market share in the U.K. (taken as a guide to Europe) in October was 43%, and other predictions suggest that the rising tide of iPhone fever will see 200 million sold in 2012–a figure that’ll be boosted, no doubt, as the 4S goes on sale today in 20 additional nations. Perfectly timed for the holidays. It’s also worth noting that we’ve known for some time the 3GS unit, which Apple is keeping on sale as its low-price entry phone, is also selling by the million, as is the older–and thus slightly cheaper–iPhone 4. In other words, it’s beginning to look a lot like an iPhone Christmas. With other predictions the iPad will maintain its dominance of the tablet market, Apple’s execs will be toasting the season. It all bodes well for 2012, especially since there are rumors the delayed redesigned iPhone 5 may arrive (possibly as soon as March), and Apple may release a 7-inch iPad. Samsung’s range of Galaxy smartphones may be beaten by Apple’s device, but sales of the various flavors of phone are probably going to remain strong enough to propel Samsung to second place. A week ago the Korean firm noted its Galaxy S II phone had set a new company record and reached 10 million units shipped. That’s no iPhone-sized figure, but Samsung of course has taken the shotgun approach to Android smartphone design, hoping some of its numerous versions hit the target, versus Apple’s highly machined sniper bullet model. Top of the range, in some senses, is Google’s own-branded Galaxy Nexus–which is a champion of NFC tech needed for Google Wallet, and which finally went on sale in the U.S. this week. There are a few issues with that Wallet rollout, but the Nexus is likely to be one of Samsung’s better-selling phones over the holidays. Samsung’s holiday season will likely be jolly, if not saucily merry. Like Santa warning that you’ve not been good, Reuters also notes that the fortunes of other top-rank Android makers are likely to be less cheery. HTC has already warned it may not do as well as it predicted, and generally slightly depressed sales in the EU, borne of the numerous financial crises, may not help. No one’s saying Android’s market share will tumble (especially propelled by Samsung and with the delicious Ice Cream Sandwich flavor of Android hitting more phones), but the game’s not necessarily going to sway Google’s way as much as it has–Apple’s sales are simply looking too strong. Last week RIM confirmed that its much-needed new range of smartphones, sporting the new QNX operating system as a direct response to iOS, is going to arrive in 2012, many months later than had been anticipated. The phones have been dogged by a number of issues, most recently seeing RIM lose a legal battle to call its new operating system BBX. The delay means RIM will quite definitely miss out on the lucrative holiday buying spree. Instantly a number of analysts suggested it may be game over for RIM–on top of its already sticky situation with the failed Playbook tablet device. RIM’s stock has tumbled. Its Yule log just won’t ignite this December. Nokia’s big hope to regain its smartphone kudos is pinned on a smallish range of devices sporting Windows Phone 7–Microsoft’s well-received (if not particularly hot-selling) new smartphone OS. But a survey by BNP Paribas has shown that the Lumia devices, expected imminently, will get at best a lukewarm reception in Europe. This is bad news, as it’s Nokia’s heartland, and tradtionally a much stronger market for Nokia than the U.S. (where the firm has repeatedly failed to dent the league tables over many years). Only 2.2% of surveyed future smartphone buyers were interested in Nokia’s phone, and that caused BNP to cut its projected sales from roughly 2 million to just 800,000. Nokia is also a great hope for Microsoft which, while it’s doing pretty well out of licensing IP to many big-name Android makers, obviously wants to sell its own platform in greater numbers because of the halo effect of sales among the ecosystem (apps, music, and whatnot). From where the Internet is standing, it doesn’t look too good for Windows Phone architecture in the holiday season…though devices will surely sell, they won’t make a dent in MS’s marketshare. So more and more it looks like 2012–likely to be the “year of the smartphone” when dumbphones in the developed world begin to rapidly fade–is going to be split between Apple and Samsung. Apple says Samsung “slavishly copied” many aspects of its design for the devices and marketing of the iPad and iPhone. Samsung says no, and is now selling the Galaxy Tab 10.1 in Australia with a “tablet Apple tried to stop” slogan. Perhaps these predictions for the multi-billion-dollar smartphone market explain why the two firms are in such a pitched legal battle. So much for the holiday spirit.